Saturn reached opposition two days ago. It’s now rising in the southeast at sunset in the faint constellation Libra. This was its closest approach to Earth in 2014, at a distance of 1.3 billion km (827 million miles) and shining at magnitude 0 (zero). That’s almost as bright as Arcturus, the 4th brightest star in the sky at magnitude -0.04. See my December 9, 2013 post for a detailed explanation of magnitude. The difference in apparent brightness will be exaggerated by the fact that, whereas Arcturus is higher in the sky, Saturn will be closer to the horizon and dimmed by thicker air, suspended dust, and water vapor. The sky map above shows the scene one hour after sunset tonight (May 12). But Saturn will remain well-placed for observing the rest of May and well into June. As the evening progresses, Saturn will rise higher and become even more prominent. Joining Saturn, higher in the sky, is Mars — still a bright object only 32 days past its April 8 opposition. Near Mars will be a nearly Full Moon. 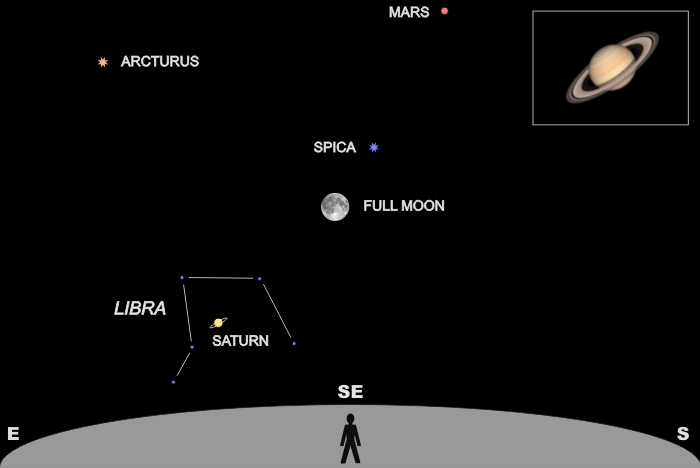 Follow a line from Mars through Spica to locate Saturn. You won’t see any of those faint stars in Libra, but they’re included just to define the constellation. This opposition finds Saturn’s rings near maximum tilt. The rings will be inclined some 22 degrees to our line of sight, more so than any opposition since 2005. See this excellent chart comparing 30 years of oppositions. Saturn will present a beautiful sight in any size telescope. But even binoculars will show the rings, and possibly Titan, the largest moon of Saturn. To the unaided eye, Saturn is often described as “straw-colored” compared to the ruddy orange-red of Mars. If you’re outside reading this on your tablet, compare Saturn and Mars visually. Compare also how Saturn and Mars shine with a steady light, while Spica and Arcturus tend to “twinkle.” I explained this effect in my August 3, 2005 post, and again in my May 7, 2012 post, which featured an actual video of a star twinkling. The inset shows what you could expect to see with a good telescope. That’s a simulated image of Saturn created using Cartes du Ciel SkyChart, an open-source (free) app that shows me what’s up in the sky for any date, time, location, and elevation on the planet. I highly recommend SkyChart for beginning astronomers. Or, better yet, get a free astronomy app that runs on your smart phone or tablet, and take it outside with you.